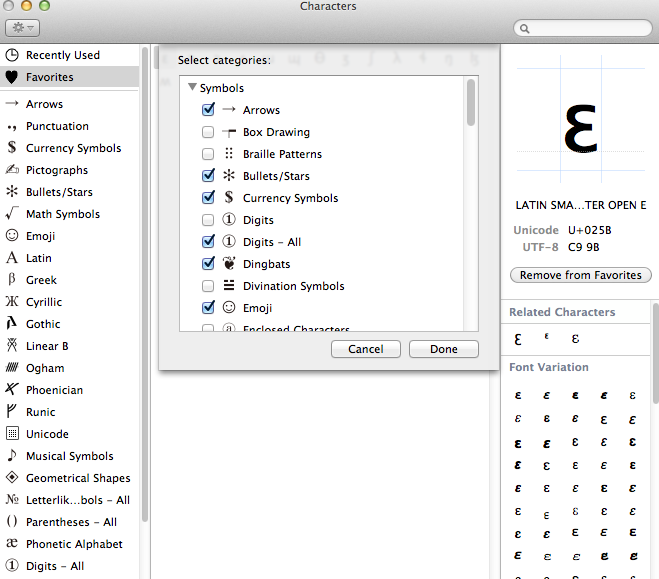 For Unicode fans, one of the bigger and more useful changes in the Mac 10.7 Lion operating system is the updated Character Viewer. Despite improvements though, it's different enough that I think some documentation is work posting. As with previous versions Character Viewer is activated in the Language & Text section of the System Preferences menu. See http://tlt.its.psu.edu/suggestions/international/keyboards/charpalosx.html for details. By default, the Viewer only gives options for Symbols (e.g. "Arrows, Punctuation, Currency Symbols, Emoji"), I actually like how the symbols have been organized into semantic groups rather than by numeric block. However, the list does not include all the scripts I need to access. Fear not though - the other block are availables. To view other blocks click the Gear icon, then select Customize List. This opens a pop-up window which provides a list of all available symbol lists, including Unicode, which is the entire list organized by Unicode block. The basic mechanism is to select the character you want to highlight. In previous versions of this tool, there was an Insert button, but this has disappeared. In this version, you need to do the following. Place your cursor at an appropriate insertion point in your document. Find and highlight your character. Double click the character. It will be inserted into your document. Note: You can also drag and drop characters into your document. A feature that I am now using is the Favorites list, a place to list commonly used characters to insert. This puts everything in one list which you can order as needed. You can add Favorites by selecting a character and either either clicking the Add to Favorites button or dragging it into the Favorites list. Although I was a little confused by the new Lion Character Viewer, I actually think it was a good overhaul. It suits the average user who needs access to common symbols and emoji, but allows us more dedicated users access to what we need. A final improvement worth noting is that the Font Variation feature is much more stable than in previous features. This is perfect for times when you need to debug a weird character/font combination.